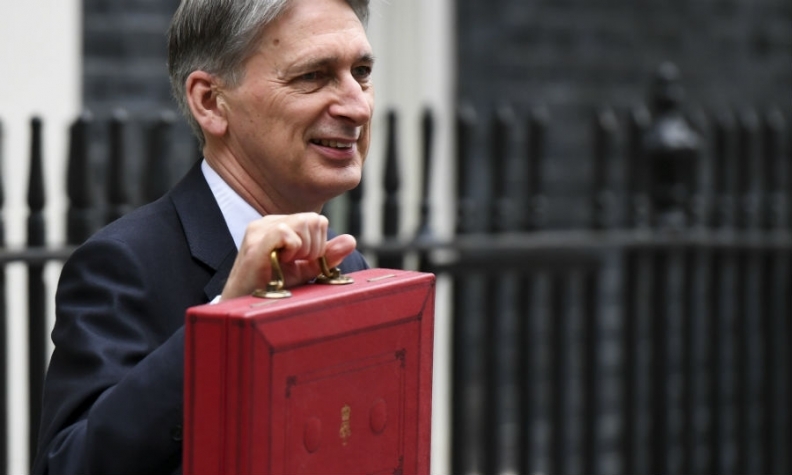 Philip Hammond, UK chancellor of the exchequer, holds the traditional red dispatch box containing the budget statement. Hammond is raising taxes on diesels to fund a clean air fund. LONDON -- Britain will increase the tax on new diesel cars that do not meet the latest emissions standards, providing another blow to the country's hard-pressed auto industry. Sales of diesel cars have fallen 15 percent so far this year in Europe's second-biggest autos market, while demand for gasoline-powered cars has increased 3 percent, as buyers shun diesels fearful of more levies and regulatory crackdowns. Since the 2015 Volkswagen Group emissions-cheating scandal, a number of major cities including Madrid, Paris and Athens have announced plans particularly focused on cutting diesel emissions including bans, fines and restrictions. On Wednesday, Britain said it would hike Vehicle Excise Duty (VED) for those registering a new diesel car for the first time starting next April that does not meet more stringent pollution requirements. "The tax system can play an important role in protecting our environment," Finance Minister Philip Hammond told parliament on Wednesday during his annual budget statement. "We owe it to our children that the air they breathe is clean." The change will add 20 pounds ($27) to the cost of VED for smaller models that fail to meet more stringent standards while those driving some larger vehicles could pay hundreds of pounds more. The existing diesel supplement in the company car tax also will increase by 1 percentage point. The extra cost will not apply to next-generation clean diesels that are certified as meeting emissions limits in real driving conditions, the government said. Hammond said the money would be used for a 220-million-pound Clean Air Fund to support local plans to improve air quality.